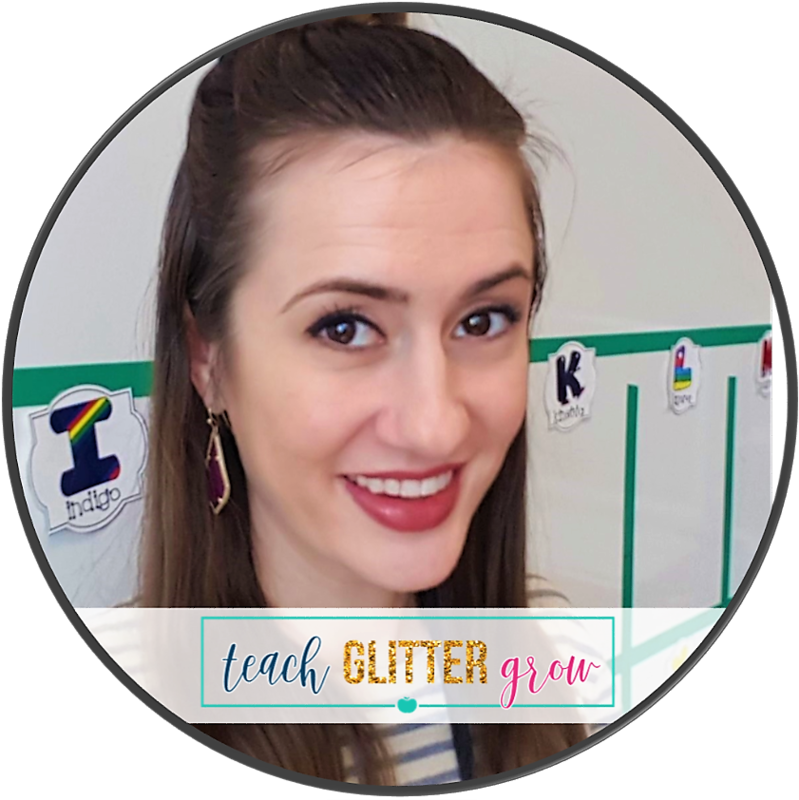 As the new year approaches, I like to think of ways that I can improve my classroom life as well as my personal life. 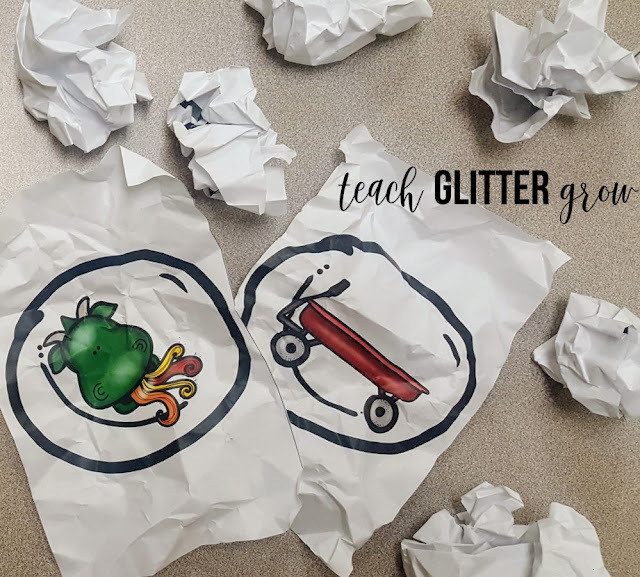 While being reflective and thinking about what is working and what is not, I couldn't help but think about the classroom environment and culture I have built this year. When trying to think of small and simple but hopefully impactful things that I can change, I began to think about the words I say and how I respond to students' problems. There were few very commonly used phrases that popped into my head that might not be the best at showing my students respect and making them feel as though their voices are being heard. 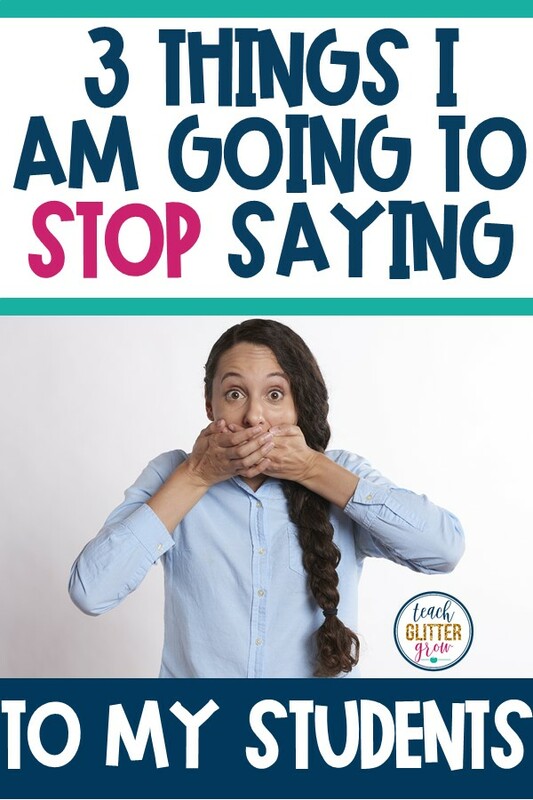 These are 3 simple phrases that I have decided to (try and) ban from my teacher vocabulary in the new year. "We are all going to the same place"
Have you ever been walk to a line at the grocery store and have someone speed walk to cut in front of you right before you were entering the checkout lane? Have you ever been waiting in a long line in traffic when someone decides to cut over in front of you at the last minute? Have you ever been waiting for a parking space in a crowded parking lot just to have another car dart into the spot before you can? As an adult, I find all of these situations extremely annoying and frustrating. Sure I'll still be able to check out, get to my destination, or park somewhere else but it is irritating none the less. Just think about how cutting in line is your students equivalent to those situations. Sure in the grand scheme of things what position you are standing in line doesn't matter but if it is frustrating to you as an adult, it is equally as frustrating to your students! Let me preface this by saying that I do believe sharing is a VERY important skill that everyone needs to learn. Unfortunately, to most young children, the word share means you give me what I want when I want it. If Johnny just picked up the green marker at the table and started using it but Susie wants it too, she expects him to hand it over immediately or chances are you as the teacher are going to hear all about how he is not "sharing". Now on the flip side, if Johnny has had the green marker for 20 minutes and nobody else has gotten to use it, that is a different story! The problem is, I have noticed that most of my students really don't see the difference. 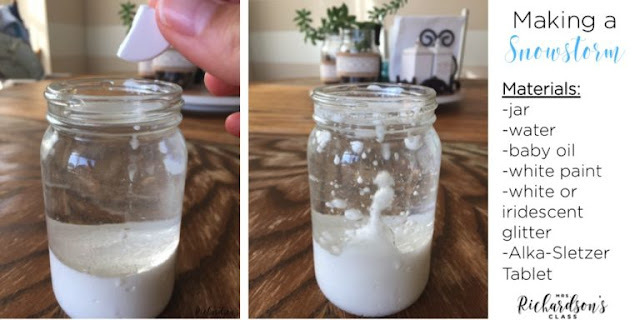 I plan to be more mindful about taking just a little time to teach students how to share and take turns. We are expected to teach so much each day that there is little to no time for teaching social skills. The biggest issue I have with that is that the lack of social skills leads to many more interruptions and distractions throughout the day which takes away from the time students have to learn. "You need to be a problem solver"
Okay, this is another skill that admittedly our students need to learn but, what does "being a problem solver" even mean? Chances are when I say that to my students, they probably have no idea what that looks like or what exactly I am expecting them to do and just leave feeling like they haven't been heard. 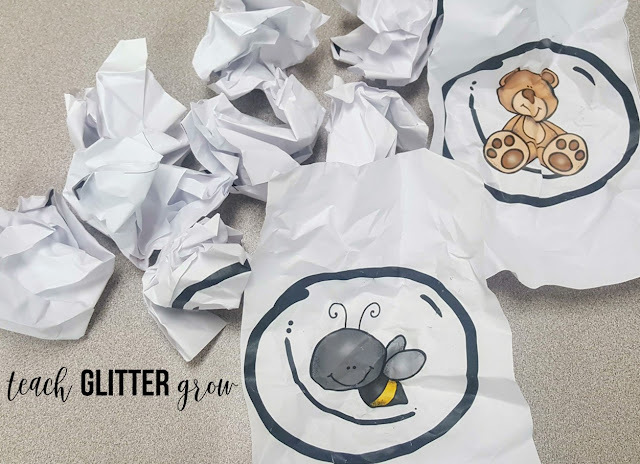 Or (even worse), decide to solve the problem by throwing a tantrum to get what they want, hitting another student, or some other undesired behavior. This is why it is important to explicitly teach students strategies to solve their problems, work with them, and model, model, MODEL until they can take the initiative and do it independently. 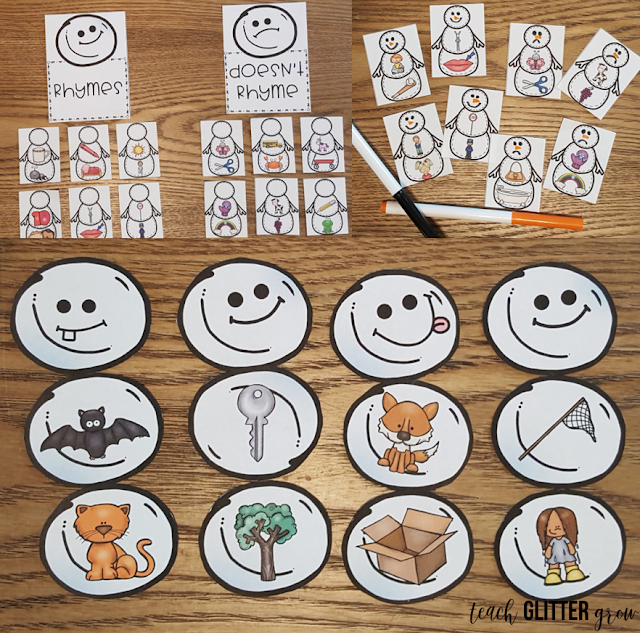 One great place to get started is showing students how to use their words and express what they are feeling. If you are experiencing a similar problem with your students, you can read about some great strategies, in this article I found: Coaching Students in Handling Everyday Conflicts. 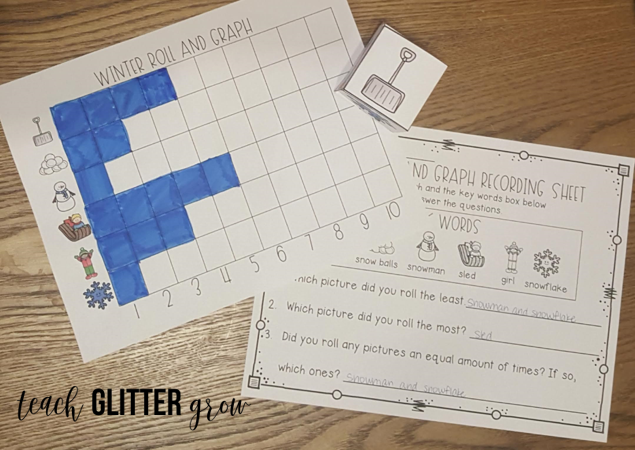 Here is to hoping that implementing these few simple changes will lead to a happy, more positive 2019 in my classroom for myself and my students. 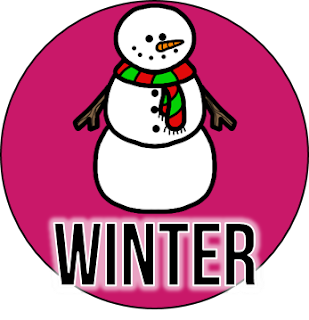 I hope that you all have a wonderful 2019 with your students! Are there any other common phrases that you can think of? Do you have any classroom goals set of things you would like to do differently in the new year? I would love to hear about them in the comments! 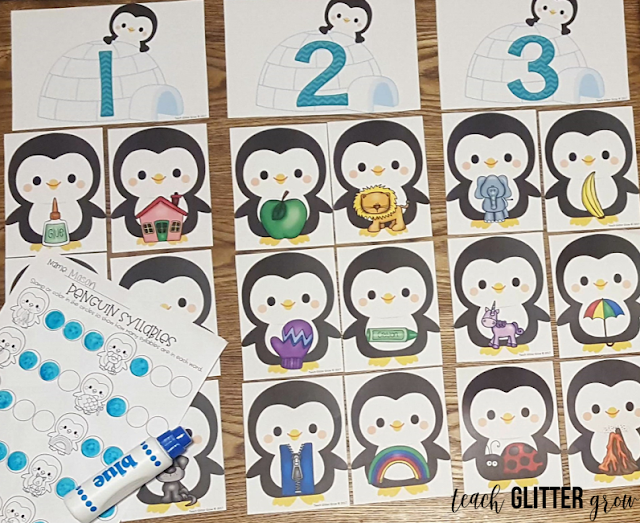 To take a more DIY approach, here are a few low prep, high engagement activities that are perfect for this time of year! 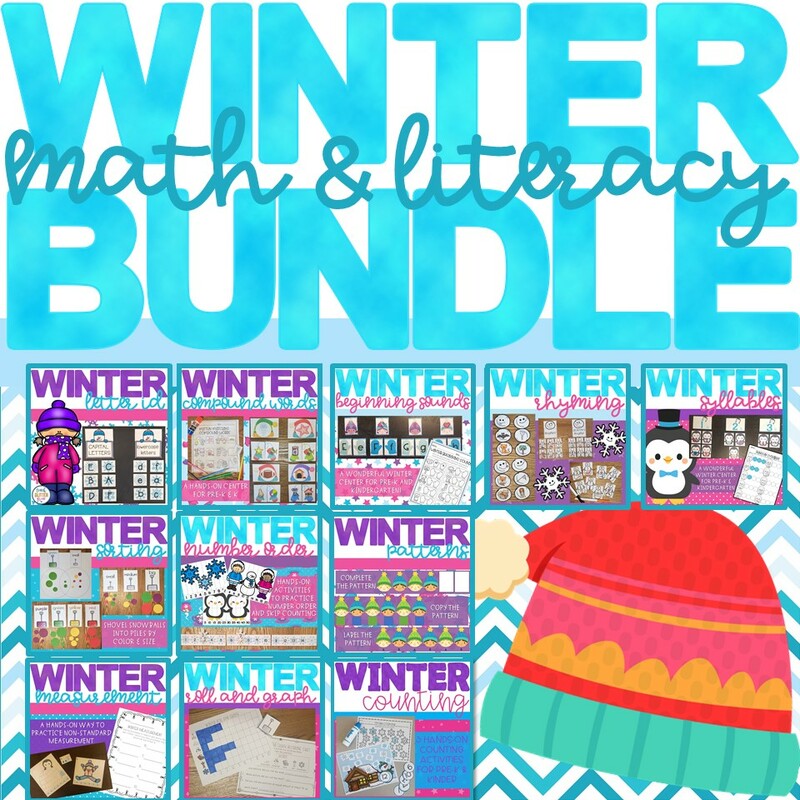 First up is a fun, hands-on math center that can be differentiated to meet all of your students' needs! 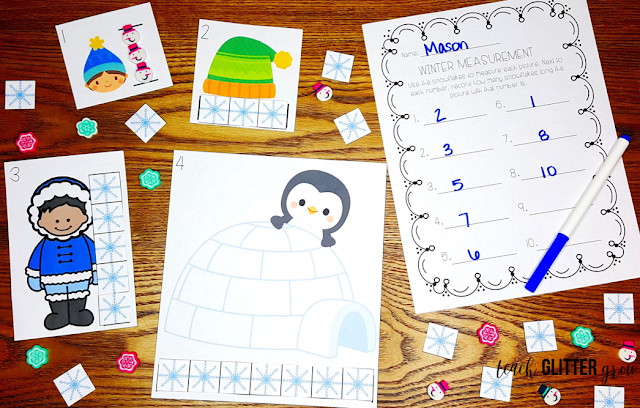 To prep this simple activity, all you need is a die, some felt, and a good pair of scissors! Fold your green felt I'm half and cut out a "Christmas tree shape". Use any other color felt to create ornaments. I made simple circles but you can get as creative with it as you want! 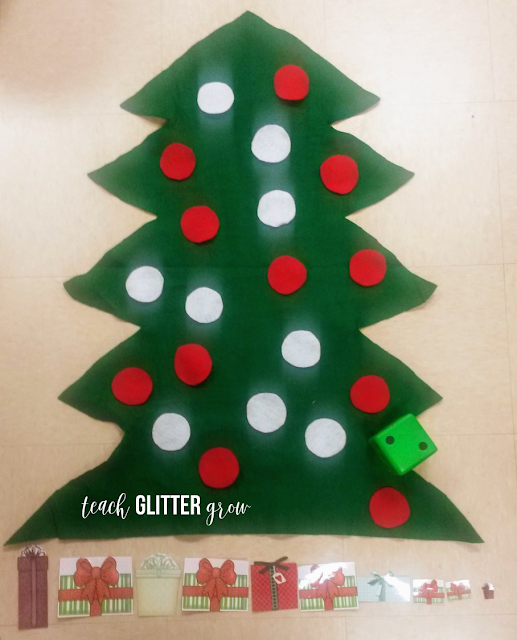 For students working on counting with 1:1 correspondence, instruct students to roll the die and count out that number of ornaments onto their tree. 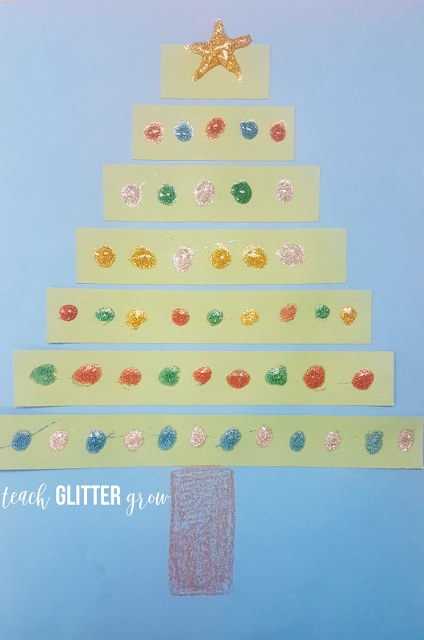 Students can keep rolling and counting until their tree is full or they are out of ornaments! To add another step, provide students with different sized "gifts" and encourage students to put the gifts in order from smallest to largest under the tree. 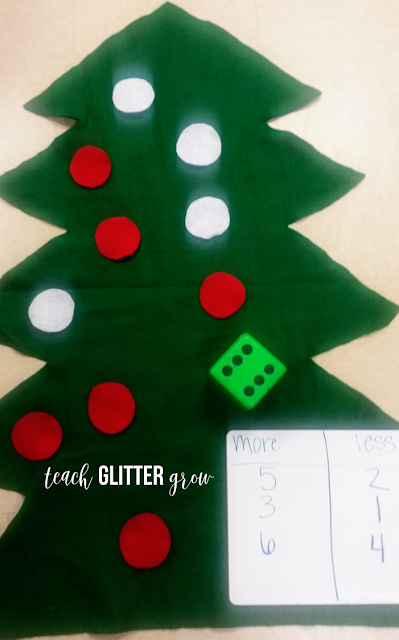 For students working on addition, instruct students to roll the die and count out that number of ornaments. Roll the die a second time and add the second quantity of ornaments on the tree. 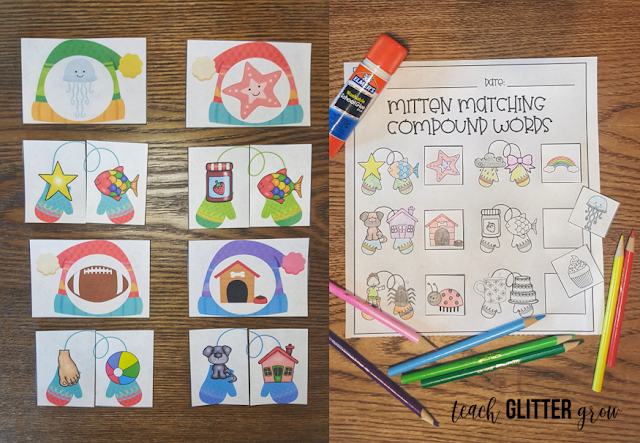 (I had my students use one color for each turn.) Have students write an addition equation to represent the ornaments they added to their tree. 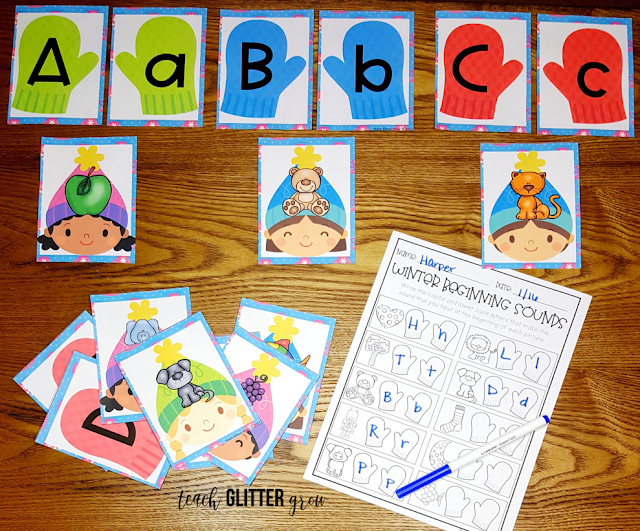 The final way I like to use this activity is to compare amounts. 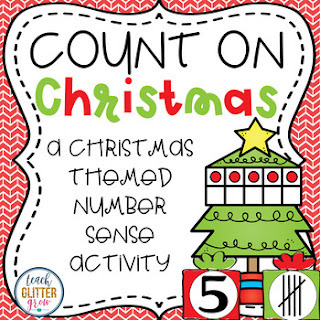 Just like with the addition activity, instruct students to roll the die and count out that number of ornaments. Roll the die a second time and add the second quantity of ornaments on the tree. (I had my students use one color for each turn.) 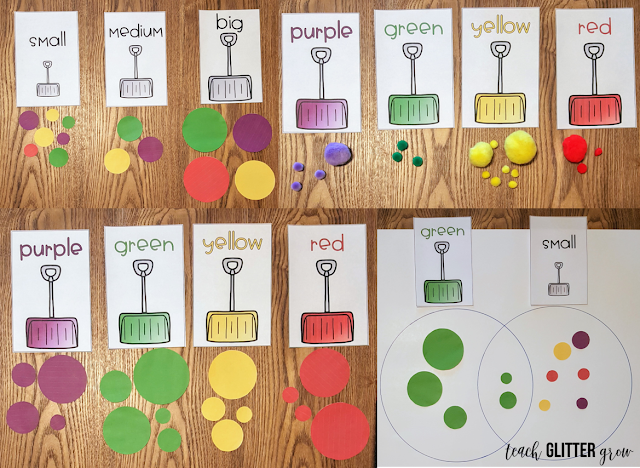 Then, students will compare the two quantities and discuss which color has more, which has less, or if the quantities are equal. This station could not be easier to set up! 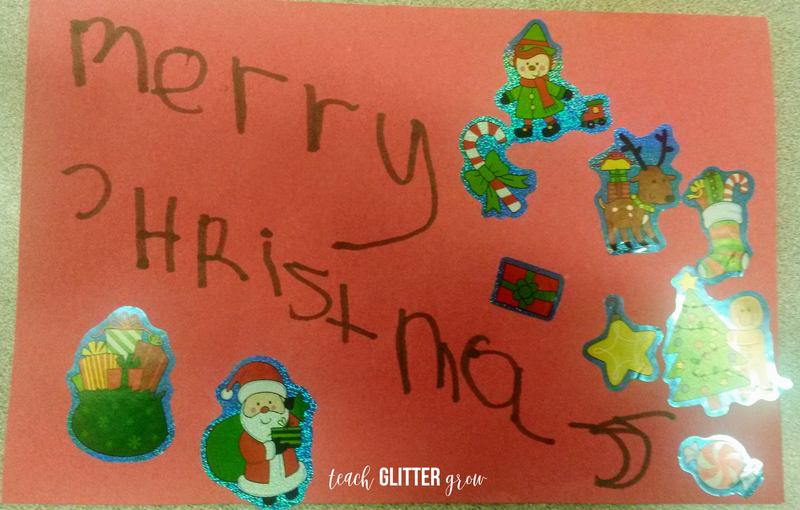 I supplied students in the writing center with markers, construction paper, and festive stickers from the dollar store. 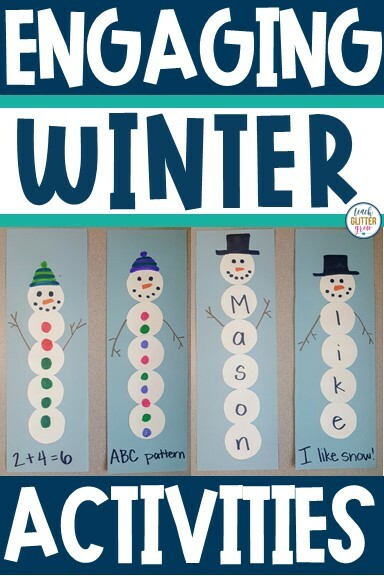 You can also display a few "holiday words" to get them started. 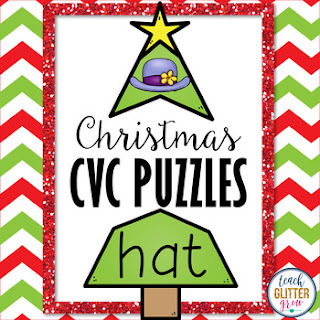 (If you need Holiday Vocab words, I have a FREEBIE for you. :) Keep Scrolling! I taught students how to fold the paper in half to make a card. They decorated the front with a holiday message. 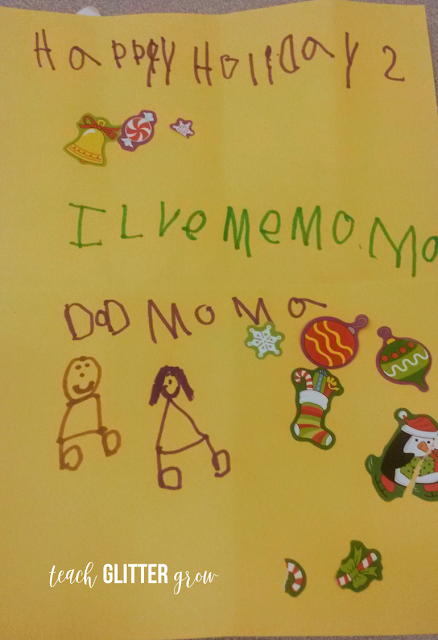 Then wrote a special message inside for whoever they were making their card for. 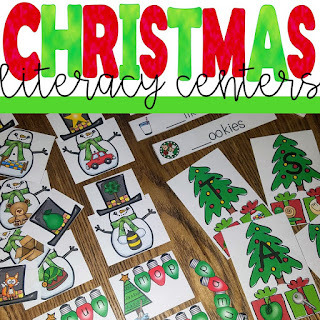 Students could also use this center to write a letter to Santa. 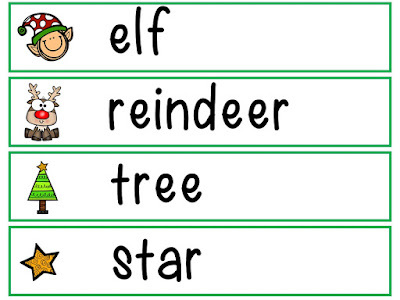 I have created a Holiday Vocabulary FREEBIE just for you! Click the image below to download. 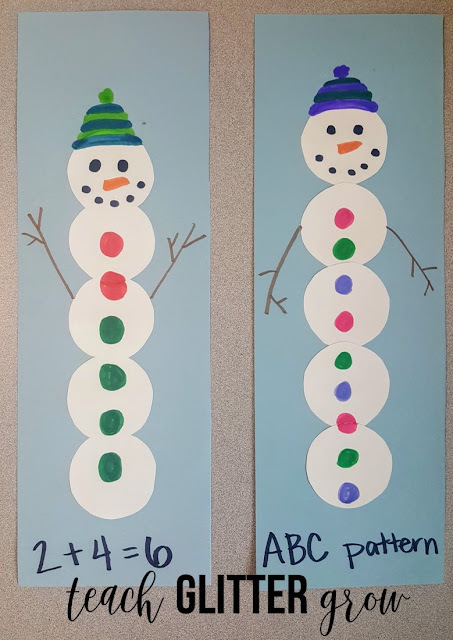 Another low prep activity that is fun for the students is this size comparing and patterning craft. 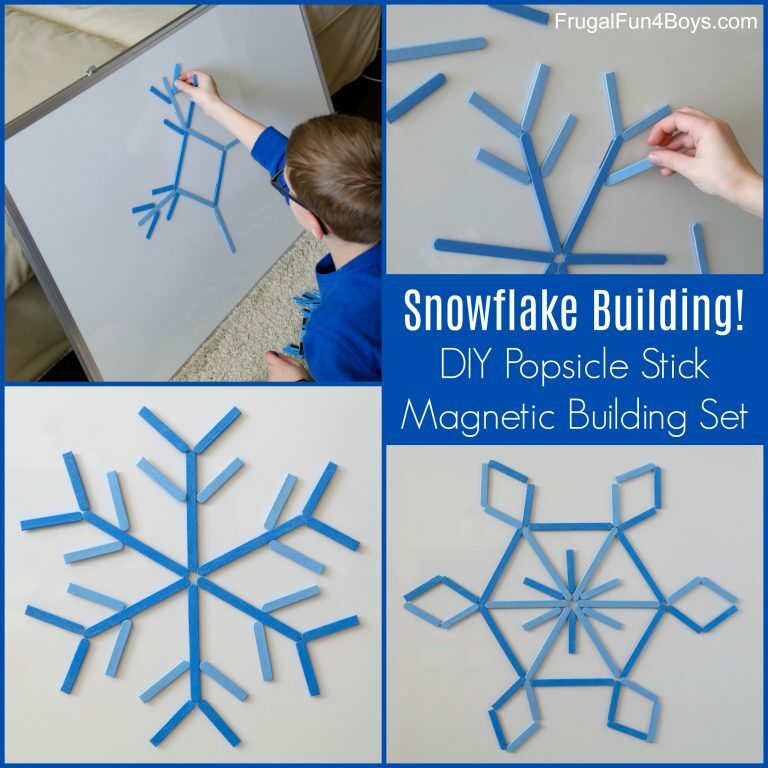 To prep this activity, all you have to do is cut several strips of green paper in different lengths. I cut mine with about an inch difference. Supply the students with construction paper, glue, and strips of paper cut into several different lengths. 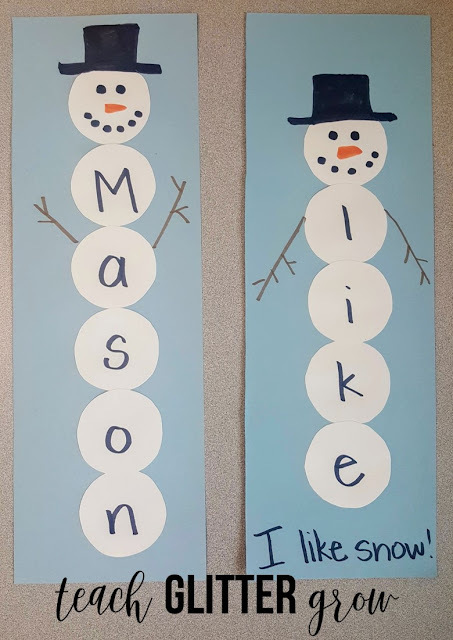 Instruct students to arrange the paper strips from smallest to largest and glue them down on a sheet of construction paper. 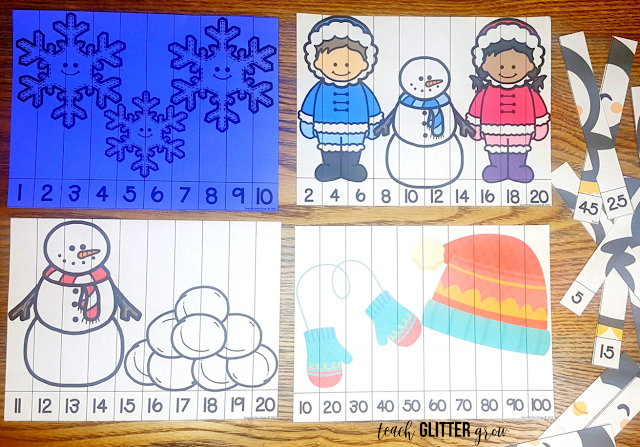 To add another skill to this activity, students can create a pattern "ornaments" on each strip. 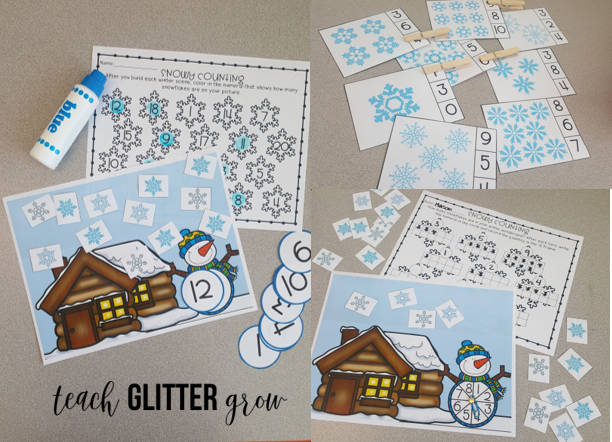 I like to use these sparkly glitter glue pens but you could also use pom poms, sequence, or any other art supplies you have! 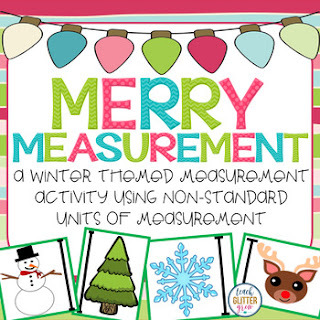 Looking for even more Christmas activities to keep your students engaged this month? 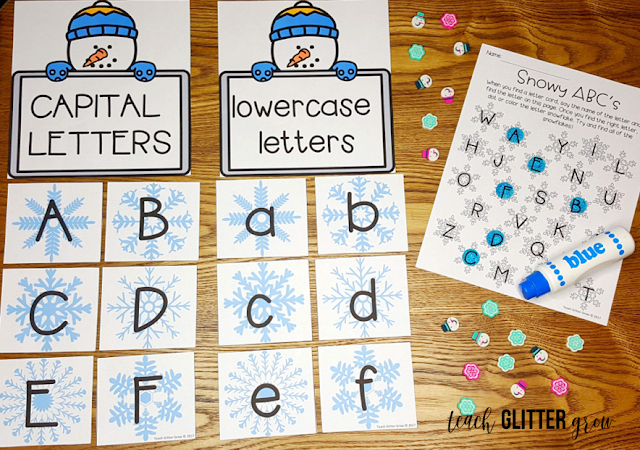 Click the overs below to grab these engaging Christmas Activities!